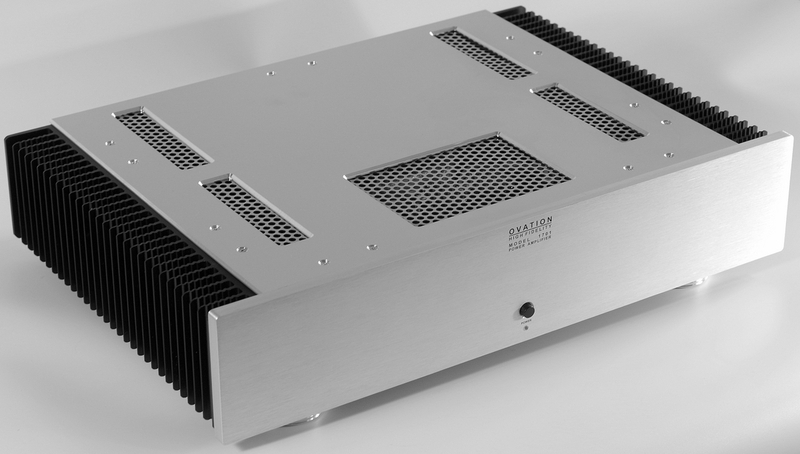 Ovation High Fidelity, a Norfolk UK based audio company, has announced the release of the Model 1701 Stereo Power Amplifier. Featuring a fully symmetrical Current Mode Topology (CMT) circuit design, low 10 parts per million distortion levels and 93 dB signal to noise ratio, the Model 1701 delivers 100 Watts RMS into 8 Ohms, and 180 Watts into 4 Ohms. The CMT design boasts 140 V/us slew rates, and a wide 250 kHz bandwidth. A very substantial 500 Watt power supply and an output stage consisting of six individually rated 250 watt power transistors per channel ensures the amplifier can drive any domestic loudspeaker load up to its rated output. Balanced and unbalanced inputs are catered for, selected by means of a push-button switch located on the rear of the unit. In the unlikely event of DC offsets or output short circuits, comprehensive protection ensures that the loudspeakers are instantly disconnected from the amplifier using an innovative solid state loudspeaker relay. Also incorporated are in-rush current limiting and speaker muting during power-up and power down, protecting speakers and amplifier alike. The Model 1701 is designed, engineered and assembled in England, comes with a 5 year warranty and sells for ₤3065-00 incl. VAT and UK delivery.